If you wish to itemize any closing costs and/or negotiated repairs for an offer, this can be done on the Negotiations tab. 1. From the Offers sub tab at left, locate the offer for which you wish to view or update information. 2. Click the + next to the offer you wish to view. This will expand the offer information. From here, click the Negotiations tab as shown circled in red below. 3. Scroll down to the bottom of the Negotiations window until you see the Closing Costs and Negotiated Repairs sections. 5. 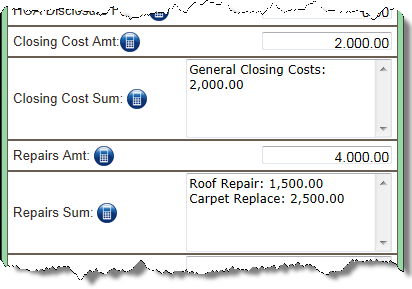 Add a descriptor in the Cost Type or Repair Type field. 6. Click in the Amount field and add the dollar amount of the item. Changes can be made to these fields by clicking the desired field, making the change, then clicking the field's green Upate button. Any items added to these fields can be deleted by clicking the red Delete button adjacent to the item. There are several lines in the Negotiations screen that relate to this itemized information (Closing Cost Amt, Closing Cost Sum, Repairs Amt, and Repairs Sum -- see the screen shot below). By clicking the Calculate buttons adjacent to these fields, you can elect to display this information there as well. To save the information there, click the Add button at the bottom of the Negotiations screen.